We took a cab to have some lunch in the the capital city: St. George's. Our driver got really philosophical about bad drivers. "A lot of people drive for themselves, but you've gotta drive for everyone". Christ of the Abyss was a gift from the Italian cruise line who's cruise ship caught fire then sunk here in 1961. 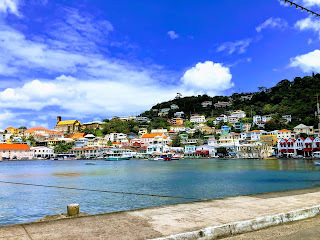 The Carenage, as St. George's harbor is referred to, was so colorful and fun. This place really feels like how the Caribbean is supposed to be. This is going to be hard to believe but we had lunch at a place called the Nutmeg Bar & Restaurant. They sure do love nutmeg around here. The place had a great view of the bay. I was excited to see roti on the menu. Roti is like an Indian-influenced curried potato and meat burrito. If you recall they had smaller handheld versions of these in Trinidad and Tobago. Well Grenada takes it one step awesomer and adds conch meat in the mix. Boom you just got flavor exploded. Went for that nutmeg ice cream afterward. Our waiter was super funny. He saw me flipping through the guidebook and was like "if you like books you should read this book about Grenada." I think that might be my first waiter book recommendation. Our guidebook said that the Grenada National Museum wasn't that great but it was only $3 to get in so what the heck. A good life lesson is that if you keep your expectations really really low then you are immune to disappointment. There was some antique rum making equipment. Some pictures of the aforementioned MV Bianca C on fire on the right then under the water, not on fire, on the left. A picture of Prime Minister Bishop hanging out with the Castro brothers. Things did not turn out well for him. And obviously there had to be a painting of a lady wearing a dress made out of nutmeg. The anticipation for tomorrow's tour of the nutmeg factory may be too much for me to bear. Nutmeg. We were now in cruise chump territory and there was a little choo-choo for the cruise chumps to ride around on so they didn't have to use their legs or speak to anyone. The path from the cruise ship dock to the city was like a long shopping mall gauntlet. Lydia wrote some postcards while I taught some random British woman how to use her iPad so she could facetime with her grandkids. They had a fort. Fort George. Why not? The local lizards had some sweet little orange neck things that they could inflate. I'd like to formally add "fire an old cannon" to my bucket list. And if we're getting specific, I'd like to fire it at a cruise ship. We had a discussion of the difference in projectile trajectories of mortars versus traditional cannons which I can safely say Lydia was riveted by. I saw this church's spires from multiple points of the city so I was interested in checking it out up close. It turned out that times were pretty tough. Trippiest travel agent advertising ever. Lydia babysat some random child at the hotel pool while I avoided the child at the hotel pool. We headed down to the beach to watch the sun set. I found some coral that looked like a unicorn horn.... maybe you had to be there. Cummin' Up was a delightful little food truck-looking thing on the beach. The menu was written on the wall in marker. There were only two choices, and we'd just had roti for lunch so that sort of narrowed it down. I went with the jerk chicken, rice, and green salad. It was dark so you can't see anything in this video but it's more of an imperfect attempt to capture a perfect Caribbean moment. We were dining on the beach, sitting next to some locals, listening to the waves roll in with some Bob Marley playing in the background. A guy came by trying to sell us some mangoes out of a bucket. I admired his pluck but I didn't need any bucket mangoes in my life at that time. By this time the guy at Esther's bar by the beach knew our names. The banana coladas smell like lovely nutmeg. Lydia said they're like banana splits mixed with eggnog.